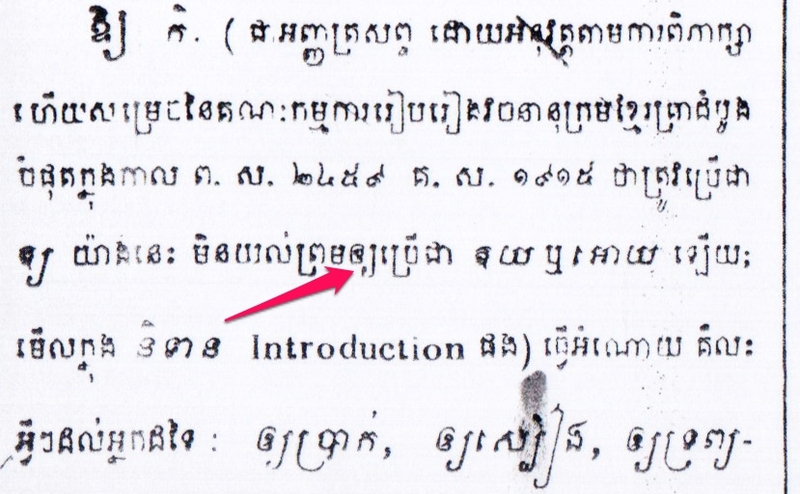 We’ve written about this before (Spelling Question), but today we discovered that in the first edition of Chuon Nath’s dictionary, he uses ឲ្យ as the head word rather than ឱ្យ as is currently placed as the head word in newer editions of his dictionary. It makes sense that Chuon Nath’s first edition would use ឲ្យ as the head word being that in all the examples throughout the dictionary, only ឲ្យ is used (outside of those times where it is stated that ឱ្យ can also be used). But what also is interesting is that even though the fifth edition and above say that ឱ្យ is to be preferred (though not excluding ឲ្យ) in the very sentence where it is said ឱ្យ is to be preferred, ឲ្យ is used! So the question remains, what is the correct spelling? Tell us what you think and why in the comments. I may provide some clues. Both spellings can nowadays be considered correct as shown in the first photo you give. However, the situation is a bit confused and confusing. In his Dictionnaire cambodgien-français published in 1935 (2 volumes), 1st volume, p. 7*, French missionary Joseph Guesdon puts ឧ៊ and ឲ in the same cell (in both Mul script អក្សរមូល [which is the one called Khmer Os Muol Pali in Khmer Unicode, and which is not to be confused with the Kham script អក្សរខម called Khmer Os Muol in Unicode fonts created by Danh Hong] and Chrieng script អក្សរជ្រៀង). Guesdon transcribes ឧ៊ and ឲ, as ŏ (i.e. a brief vowel) and indicates that it should be pronounced as in French bol. He puts ឧ៊ and ឲ after ឦ (which he says is to be pronounced ei as in French abeille), and before ឪ (which he transcribes as ău, and surprisingly indicates that it ought to be pronounced a-ou as in French à ouvrir). He gives ឱ after ឰ, and before ឳ (which is given with a variant I can’t retranscribe as it doesn’t exist in Khmer Unicode fonts, but it has the shape of ឲ with the upper part continuing with a sort of hook). For ឱ, he gives the value ō and says it’s to be pronounced ô as in French vôtre (until the end of the 19th century-beginning of the 20th, French made a distiction between short and long vowels in carefully articulated speech, which is no longer the case). What is also surprising is that for the following letter ឳ, which he translitterates as ou, he states that it should be pronounced o-ou as in French outrage. Guesdon’s values given to the pronunciation of these written signs is suspicious. His dictionary has been quite harshly criticized by George Cœdès (http://www.persee.fr/web/revues/home/prescript/article/befeo_0336-1519_1915_num_15_1_5240 and http://www.persee.fr/web/revues/home/prescript/article/befeo_0336-1519_1920_num_20_1_5562, mostly on the meanings of words). However, it’s true that ឧ៊ and ឲ have been confused by the Khmers themselves. I remember having seen the word ឧកញ៉ា written ឲកញ៉ា, probably in the Buddhist Institute Khmer Dictionary itself, but unfortunately I can’t remember where (not at headword ឧកញ៉ា anyway). There’s another Cambodian-French Dictionary published in the same period, i.e. the Dictionnaire Cambodgien-Français by S. Tandard, published also in 1935 (2 volumes). In the first volume, on the 4th page (no pagination), the ស្រៈពេញតួ are given as follows: អ â, អា a, ឥ ĕ, ឦ ĕy, ឧ៊ ŏ, ឪ ŏu, ឫ rưˇ, ឬ rư, ឭ lưˇ, ឮ lư, ឯ ê, ឰ ay, ឱ ô, ឳ ău. What is interesting is to jump to the lexicon itself. There’s a whole section with words starting with ឧ៊ (pp. 140-160). 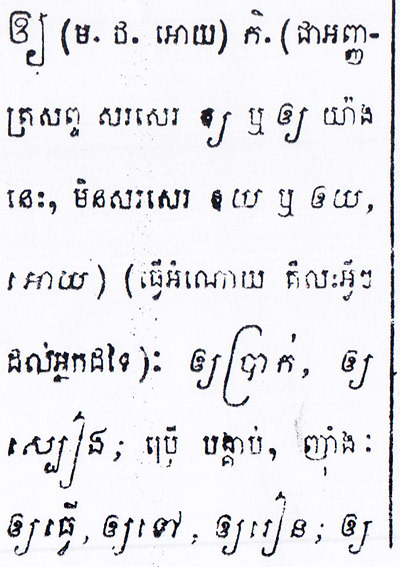 Tandard gives អុ and អ៊ុ as variants of ឧ៊. The word Oknha has two spellings: ឧ៊កញ៉ា on page 141 and ឧ៊ក្ញា on page 142. Sometimes Tandard gives only one spelling for a word, some other times he gives variants. For instance, ឱកាស has only one spelling; but ឱង (euphonic word) is also spelled ឲង. ឲង្កា meaning “signes numériques, chiffres” has one spelling, whereas ឱង្ការ “parole sacrée” is also written ឲង្ការ. ឲម “invocation mystique” has no other variant, as well as ឲ្យ. I don’t know on what grounds he relies for the spelling. Michel Antelme, INALCO, Paris, France.